Since March 2018, I have been working with the Build Change Philippines team in Metro Manila. The island country is absolutely breathtaking, and the team here is incredible! Examples of block laying before and after training. 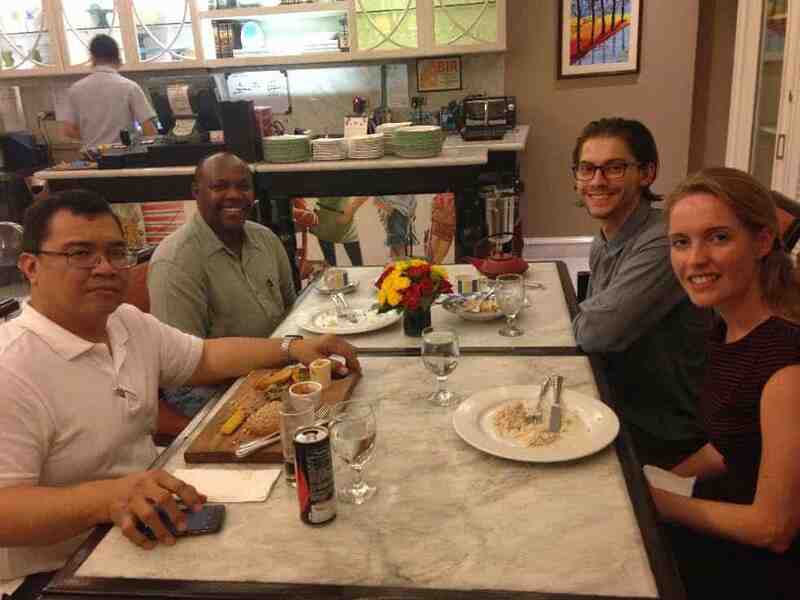 In early April, I conducted a presentation for the Philippines team on my previous experience with Build Change, as well as my experience with retrofit programs in emerging countries outside of the organization. The team of engineers in the Philippines is well-versed in retrofitting techniques as well, as that is the primary focus of the team at the moment. I have also spent some time reviewing and making comments on Build Change Philippines construction package documents. These include evaluation checklists, specifications, drawings and details for retrofitting houses in Metro Manila. The process shed light on the team’s current practices, as well as ways forward from the current status of the program. 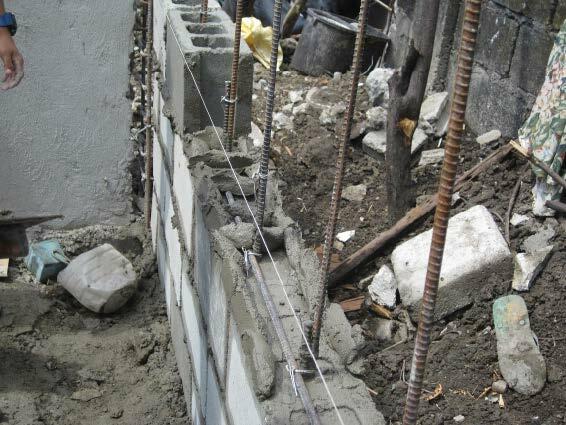 The goal is to retrofit houses in Metro Manila before the next tsunami, typhoon, or earthquake – all of which are potential risks in the Philippines. To support the team’s efforts, I developed a draft Retrofit Card for one-story masonry residential buildings in the Philippines. The efforts in Metro Manila are primarily concentrated in the neighborhood of Pembo, which has a high percentage of informal residential buildings. I accompanied the technical team to a construction site in Pembo to observe the quality of construction being performed. 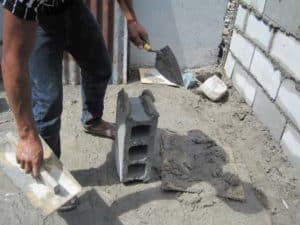 Together, we noted the need to address the quality of the mortar, the placement of bed and head joints, the placement of vertical and horizontal reinforcement, and the quality of the grout being used. All of these are important factors in retrofitting and new construction, as they support the building in the face of natural hazards. I conducted hands-on training for Build Change technical team and the contractors in Pembo on required mortar consistency and guided the block layers on the expected quality of bed and head joints. This addressed one of the primary concerns I had when visiting the construction sites. We also experimented on the possibility of using ladder wire joint reinforcement, breaking part of the web of hollow concrete blocks to create bond beams for horizontal reinforcement placement, and adequately grouting only cells with reinforcement (partial grouting) to save on wall weight, labor and cost in confined masonry construction. We hope that this will help safer walls and buildings be constructed faster, with minimal price differential. In addition to supporting the Philippines team, I also prepared a technical paper to be presented at International Conference on Disaster Management 2018, at Andalas University, Padang, Indonesia on the first week of May 2018. 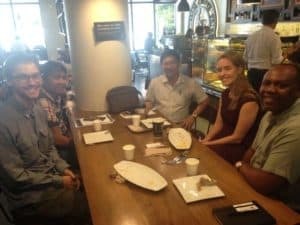 I was lucky enough to join a discussion with Dr. Fernando Germar, the Director of the Construction Department at the University of thePhilippines. 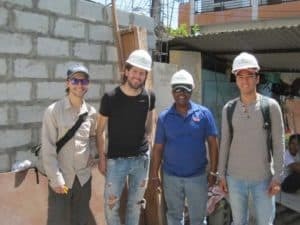 We talked about Build Change’s new confined masonry home retrofit program and took him and his graduate student to Pembo to see the construction sites we had previously visited. 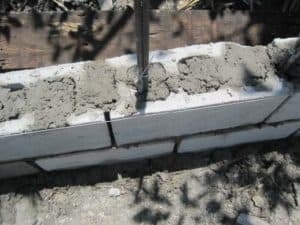 Confined masonry construction is not common practice in this region, so it is therefore not addressed in building codes. He agreed to help Build Change with contacts in academia and in the Department of Public Works and Highways so that Build Change can reach a wider audience and awareness of the construction type. We also held discussions with Engineer Danilo Domingo, the President of the Association of Structural Engineers of the Philippines (ASEP), to introduce him to the Build Change retrofit program and the confined masonry system Build Change is using, which is currently not addressed by the country’s building codes. ASEP is responsible for developing the National Structural Code of the Philippines (NSCP). He plans to invite Build Change to the full board meeting in June 2018 so that Build Change can present the retrofit program methodology, design and construction practices. The team and I also attended the 2018 Fair Housing Awards dinner with contractors who are Build Change partners. About 30 miles south of Manila lies the Philippines’ second most active volcano, Taal Volcano. It is known as the smallest active volcano in the world, but don’t let that fool you! Since the 16th century, it has erupted over 30 times and has led to the deaths of nearly 5,000 people. 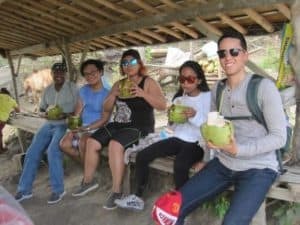 After about a three-hour car ride followed by a half hour boat ride and finally about an hour hiking, the team eventually got to the top of the caldera of the volcano inside a volcano island in a volcano lake. The view was breathtaking and the smell of Sulphur still gushing out reminded us of this natural marvel.